Learn about the differences in coverage between owner and non owner SR22 insurance. Then start a quote now or call us today. The main difference between non owner SR22 vs SR22 insurance is whether you own a vehicle or not. Whether you need owner or non owner SR22 insurance, the most common reason to buy it is for license reinstatement. Non owners SR22 does not insure a vehicle, while SR22 insurance is tied to a person’s vehicle insurance policy. What’s the difference between non owner SR22 vs SR22 insurance? SR22 non owner insurance is for non vehicle owners, while SR22 insurance is for individuals who own a car. Whether you need owner or non owner SR22 insurance, the main reason for purchasing it is for license reinstatement after a drivers license suspension. When your driving record accumulates more “points” (traffic violations) than the state allows, or if you’ve committed a DUI or DWI offense, you will have your license suspended and will be required to carry SR22 insurance to continue driving. There are other non-traffic related situations that can lead to an SR22 filing requirement, such as child support cases, unpaid traffic tickets, fines, and/or court judgments. In some states you may not be eligible for SR22 coverage in certain alcohol related cases or other situations. Purchasing SR22 insurance does not automatically reinstate your driver’s license. In some cases you may have to go through a mandatory suspension period before you qualify to reinstate your license. This is on a case by case basis, so make sure you are eligible to get your driver’s license back before purchasing a policy. People who do not have a clean driving record are considered high risk by standard auto insurance companies. An SR22 certificate is, therefore, high risk insurance. If you are required to purchase this certificate, but don’t own a vehicle to attach it to, you will have to file a non owners certificate with the state. There are other variations of SR22 insurance. In Indiana, the BMV may require individuals to file both an SR22 and SR50 certificate of financial responsibility to have their license reinstated. In Florida and Virginia, DUI / DWI convictions require filing an FR44 certificate with the state. And another type of SR22 insurance is called Broad Form insurance, but it is not offered in every state or by every provider. You will be required to carry SR22 insurance for 3 to 5 years in most cases, and in most states. Whether you need non owner or owner insurance, be aware that you must never miss a premium payment for as long as you’re required to carry it. If you do, you will experience immediate license suspension, your insurance requirement will be extended, and you’ll have to pay all fees and penalties associated with license reinstatement again. What are the differences between non owner SR22 vs SR22 insurance? SR22 insurance for vehicle owners is also referred to as SR22 owner or owner-operator insurance. One difference between non owner SR22 vs SR22 insurance is that, in general, an owner-operator policy is more expensive than an operator’s policy, and your age and the driving history can play a major factor in price. Also the year, make and the model of the insured auto is important. If the car is financed you’d need full coverage insurance, which could impact your rate significantly. Other factors that affect your rate include being a young driver, or having a lot of points on your driving record. In some instances, depending on the state you reside in, you may be able to reduce your rate by purchasing a stand alone insurance policy and a non owner policy with an SR22 endorsement. However, there are just a few states that allow this. Speak to one of our licensed agents for a free consultation to find the cheapest SR22 rate and arrangement for you. Another aspect of non owner SR22 vs SR22 insurance is if you currently have a non owner insurance policy (you do not own a vehicle) and later purchase one, the non owner policy must be converted to an owner or owner-operator policy. This is not an automatic process. You should contact your SR22 provider in advance to make a change from a non owner to owner policy, so you’ll know whether you can afford the new premium after a car is added. For example, in Florida a non owner policy is fairly reasonable, but increases drastically when a car is added to the policy. Your premiums could change a little or a lot, depending on the state you reside in; the number of violations on your record in the past 3 years; the year, make and price of the car; and whether you need full coverage or not. A non owner / non owner SR22 policy provides secondary liability coverage when you operate a vehicle you do not own. A non owner / non owner SR22 policy helps pay personal injury and property damage claims if you cause an accident. Non owner SR22 insurance is different from owner insurance because it insures you for liability instead of insuring a specific vehicle. It’s important to understand the limitations of non owner insurance coverage. Since a non owner policy does not insure any vehicle, you must be certain that any vehicle you operate is insured by the owner. If you cause an accident, non owners insurance covers auto damage, personal injury and/or property damage claims of the other party that exceed the insurance coverage on the car you are driving. Your non owner SR22 insurance pays the difference, up to the maximum of its coverage limits. A non owner policy does not insure you if you’re injured in an at-fault accident. It does not cover any cars in your household, rental cars, commercial vehicles or any type of employment-related vehicle. Broad form vehicle insurance is another type of non owner insurance, but it is not available in every state, or from every insurance company. It is slightly more expensive than a non owner policy. It works similar to non owner insurance, providing liability-only insurance on any owned automobile (if it is registered to that person) or any non owned auto that you may drive on an occasional basis. This type of policy excludes any cars in the household that you do not own. This particular type of policy may suit a person who owns several older cars he/she may drive once in a while, and instead of carrying insurance on each vehicle, you may purchase a broad form policy that will cover any of the cars that you drive. The big difference with this type of policy is that it only covers you, and no other person is allowed to drive those vehicles. Similar to a non owners policy, an SR22 endorsement can be attached to a broad form policy. When you’re looking for non owner insurance companies, remember that not all standard auto insurance providers offer high risk insurance. 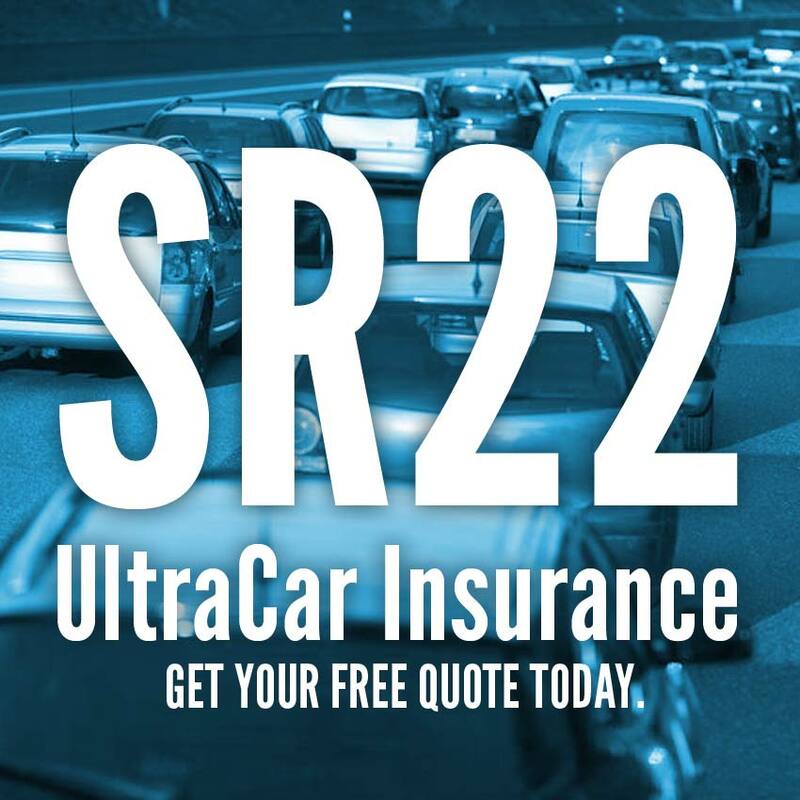 UltraCar Insurance agents know all the ins and outs of non owner SR22 vs SR22 insurance, and are licensed in each of the states we operate. We work with top insurance providers and are able to find the cheapest SR22 insurance to meet your particular needs. For competitive SR22 quotes, give us a call or start a quote today!